My ‘Patrick’ abutilon has celebrated lots of “holidays” in its first year, rarely out of bloom. It grew so fast that I had to move it. After a brief whimper, it accepted its job to fill this blank space. Drought and heat didn’t faze it (though I put a slow hose on it now & then), so I think it’ll be a favorite haunt by next Halloween. Oh, it gets morning sun, afternoon shade. On calendar events, for the first time in CTG’s history, we taped a garden on April Fool’s to air on Halloween! The real treat, and no fooling, is that we visit Zanthan Gardens in her early spring garden to prompt a few ideas for your fall planting scurry. Most significant is her eloquent philosophy of gardens and how she applied it to hers. (These images captured from the video). As one of the first garden bloggers in the country, Melissa opened up a whole new conversation among gardeners, not just from around the country, but from the other side of town. An exacting gardener, she gives precise details about planting, bloom times, seed sizes, and specimen habits. As a creative, curious gardener, she shares her investigations, unafraid to include failure as well as success. She also keeps a short thumb on the hose. No radical water bills at Zanthan Gardens! To go along with our tough plants theme, Tom joins Tricia Martin from Forever Gardens for her short list of plants that survive on their own. Tricia reeled off the list right away: the plants in her garden that bid goodbye to mom and dad when she and husband Jon opened their nursery seven years ago. In their dedication to connect you to great plants for not-so-great weather and soil, their brood was on their own. Instead of suffering separation anxiety, their plants partied down! One is thryallis (Galphimia gracilis). Mine is in former photinia-ville, where its job is to hide the air conditioner and shade it a bit. I love this fast-growing, tough, and pretty shrub. Nearby is a cenizo, another one on Tricia’s list. Mine is ‘Silverado,’ a white-blooming version. Behind them are Iceberg and Mrs. Oakley Fisher roses, surprisingly drought-tough too. Get Tricia’s complete list and extensive details about each plant on CTG’s web site, including plants we didn’t have time to mention. 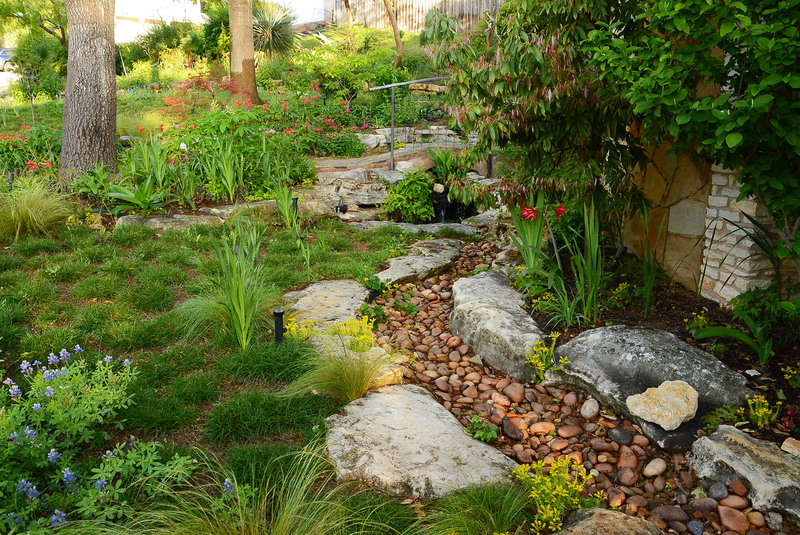 For more tough plant ideas, see what survived drought in Getting Grounded’s garden. I’d love to have your list of tough-as-nails plants! We’ll put them on CTG’s site to assist fellow water-savers. One note: when moving drought-tough plants, as I just did with my Plumbago scandens, it doesn’t hurt to give them a bit of shade. It’s cooler, but afternoon sun wilts them pretty fast. Here’s my quickie version until their roots catch up a bit. If you miss the broadcast, watch Melissa’s garden, Tricia’s tough plants, Daphne’s tips on when to prune oaks, and how Trisha Shirey forces bulbs on KLRU.TV or on iTunes. And if you’re in Oklahoma, starting November 3, you can watch us on KRSC!